37 ACRES OF TILLABLE LAND! 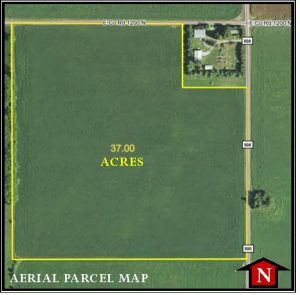 | Lawson & Co.
37 ACRES OF TILLABLE LAND! Directions to Property: Take SR 236 east from Roachdale or west from North Salem to CR 450 E. Go south on CR 450 E, which turns into CR 500 E, to the property at the southwest corner of CR 500 E & CR 1200 N.
TERMS: Purchaser to pay 10% down day of auction with balance due on or before March 21, 2019. TAXES: Purchaser to pay real estate taxes beginning May 2020 and all real estate taxes thereafter. FINAL BID: Property to sell subject to final approval of the seller.